Multiple phases of wall construction (including Crusader) visible outside of the Al Aqsa mosque. 125 All Jews expelled from Jerusalem by Hadrian after Second Revolt. 335 Constantine reverses Pagan/Christian balance of power. Christians gain supremacy in Jerusalem but Jews are still prohibited by living in the city. 615	Persian army under King Chosroes captures and sacks Jerusalem. "True Cross" is taken to Ctesiphon. Christendom shaken. Persians set fire to Holy Sepulcher. City gates opened to them. ca. 620 The Miraj, Muhammad's night journey of Sura 17 of the Quran. al-Buraq ("lighning") was his stead. Omar Captures Jerusalem from Christians after a siege. He agrees in treaty with Christians to continue prohibition of Jews. He agrees to protect Christian property and does not massacre the population. 641 Omar revokes Jerusalem treaty and allows Jewish settlement in Jerusalem in the southern part of the city after 5 centuries of absence. Document in Cairo Genizah indicates he authoirzed 70 Jewish families to settle in Jerusalem. 670 Bishop Arculf describes a square house of prayer built of wood. 685 to 691 Caliph Abd el-Malik has the Dome of the Rock Rock constructed. The Haram ash-Sharif. 691	Dome of the Rock (Arabic Qubbat as-Sakhrah) and the al-Aqsa mosque are built in Jerusalem by Caliph Abd el Malik. At one point, he can not return to Mecca because of a revolt and he designates the Dome of the Rock as the focus of hadj. This changes with his reconquest of Mecca. 967 The Anastasis of the Holy Sepulcher burned by Muslims and Jews. The Patriarch is killed. 1009 Holy Sepulcher razed to the ground. Bedrock hacked and carried away. Caliph Hakim denounced the miracle of the Easter light as impious magic. 1027-8 Al-Zahir restores Mosque of Omar mosaics. 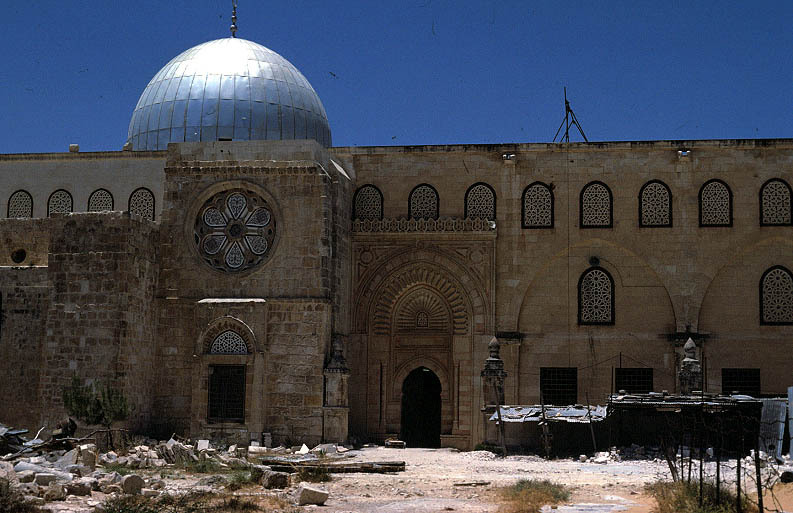 1036 Al Aqsa mosque rebuilt. 1071 Turcoman Chieftain Atsiz occupies Palestine and Jerusalem. 1091 Artuk succeeded after his death by sons Soqman and Il-Ghazi. 1098 Fatamids defeat Soqman and retake Jerusalem from Seljuk Turks. Most Christians driven from the city by Muslims and Jews. Seljuks were busy fighting against oncoming First Crusade. 1099 June 7 Crusaders besiege fortress. Gov. Iftikhar ad-Dawla defends. 1099 June 12 First assault launched. 1099 June 12 Crusaders take the city with great wooden towers. Iftikhar surrenders and ransoms his life and his troops. 30,000 are not ransomed and die. 1099 July 15 Crusaders celebrate their victory with procession to Holy Sepulcher. Godfrey of Bouillon was elected ruler. 1099 August 1 Arnulf chosen as patriarch in Jerusalem. 1099 to 1149 Rebuilding of Holy Sepulcher with elements of Burgundian Romanesque. Added a big bell tower. 1100 December 25 Baldwin I was crowned after death of his brother. An energetic, ambitious and unscrupulous man. Rules until 1118. 1118 Baldwin II crowned. Rules until 1131. 1129 Foulques, count of Anjou arrives in Jerusalem and married Melisende, daughter of Baldwin II. 1131 August 21 Baldiwn II dies. Foulques becomes ruler. 1131-1332 Love affair between Melisende and Hugh of Puiset (her 2nd counsin and childhood friend. Scandal and Hugh was supposed to go to the lists, but didn't. Eventually assassinated. 1143 November 10 Death of Fulk of Anjou and Regency of Melisende. 1145 Baldwin III old enough (15 years old) to rule, but Melisende refuses. 1148 May Louis VII marches to Jerusalem. Crusader princes gather at Jerusalem. 1149 July 15 Restored Church of Holy Sepulchre consecrated. 1152 Melisende's regency ends. War between Melisende and her son who becomes Baldwin III and she is besieged in David's Tower. Baldwin III crowned king. Rules until 1163. 1162 February 10 Death of Baldwin III. 1162 February 18 Amaury (brother of Baldwin III) inherits thrown from childless borther. Rules until 1174. 1174 July 11 Amaury dies. Baldwin IV (, aged 13, the Leper King). Rules until 1185. 1176 Marriage of Sibylla of Jerusalem and William of Montferrat. 1177 June Death of William of Montferrat. 1183 November Isabella of Jerusalem marries Humphrey IV of Toron. 1185 March death of Baldwin IV. Baldwin V (the nephew) rules as a child for a year. Regency of Raymond III. Raymond concludes 4 year truce with Saladin. 1186 September? Coronation of Sibylla and Guy of Lusignan. 1186 Guy de Lusignan, the second husband of Amaury's daughter Sybil, ascended the throne. 1187 July 4 Horns of Hattin battle. 1187 October 2 Saladin enters Jerusalem on the anniversary of the Prophets Night Journey into Heaven. 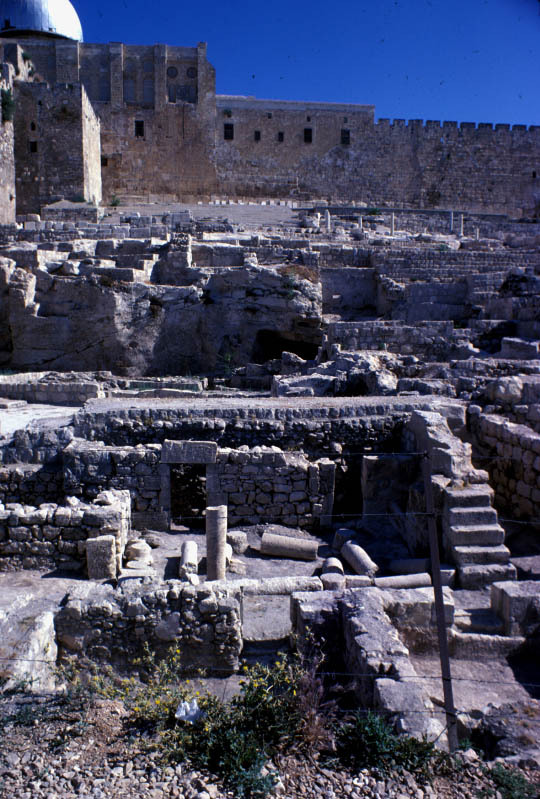 City walls strengthened by disassembling Crusader monasteries of St. Lazarus and St. Stephen's. 1192 January Crusaders break off siege of Jerusalem. 1193 March 3 Sultan Saladin died at Damascus. 1219 al-Mu'azzam has some walls dismantled. 1229 February 18 Treaty of Jaffa grants Jerusalem to Emperor Frederick II. Granted by the Sultan of Egypt for 15 years. 1229 March 18 Frederick II "maybe" crowns himself in Jerusalem. No one cheers. 1239 November al-Nasir Daud of Kerak attacks city and citadel besieged. 6 day siege and city falls. 1241 Treaty of Richard of Cornwall allows city to return to Crusaders. 1243 Templars reoccupy the Mosque of al-Aqsa. AD 1244 July 11 to August 23 Turks (Khwarazmians) sack Jeruslaem. Destroying part of the church of the Holy Seplucher and pillaging Christian graves. Armenian Church of St. James is destroyed. Priests murdered in their churches. 1190 Conrad de Montferrat marries Isabelle (Amaury's younger daughter) and ascends throne. 1192 April 28 Conrad de Montferrat murdered by Assassins. 1192 May Count Henry de Campagne married Isabelle and rules Jerusalem without royal title until 1197. 1969 Jerusalem: Rock of Ages. Translated by Judith Landry. Harcourt & World Inc. New York. Multiple wall phases visible between the Al-Aqsa mosque and Mazar's excavations (foreground). The exposed ruins in the foreground date to the Roman Period. Photo from 1980. 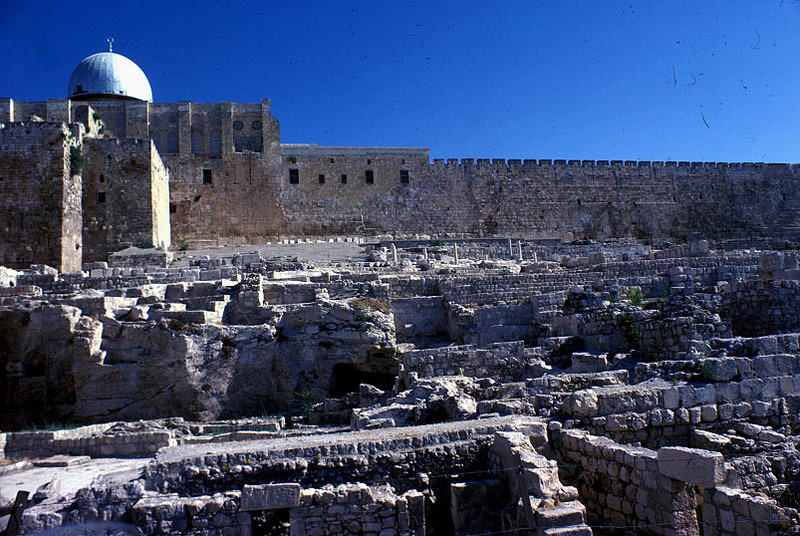 Al Aqsa Mosque was occupied by the Templars during the Crusader occupation of Jerusalem. They termed it Palatium Salomonis. Photo from 1980. 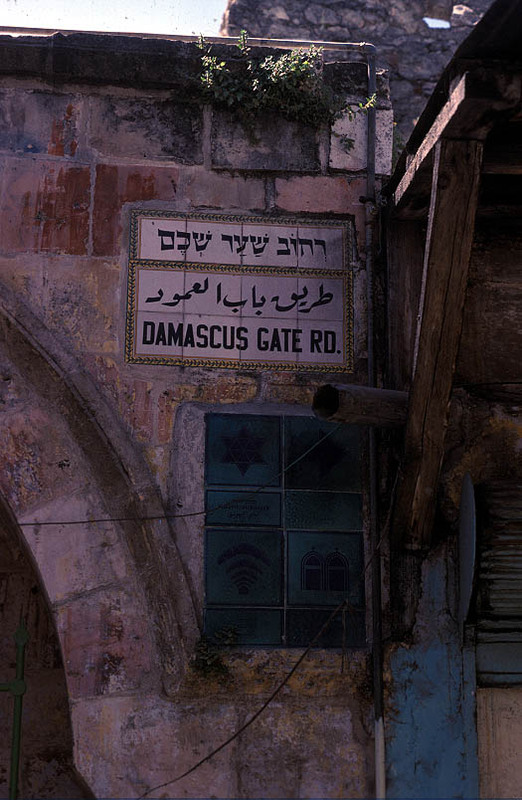 Sign at Damascus Gate in Jerusalem. 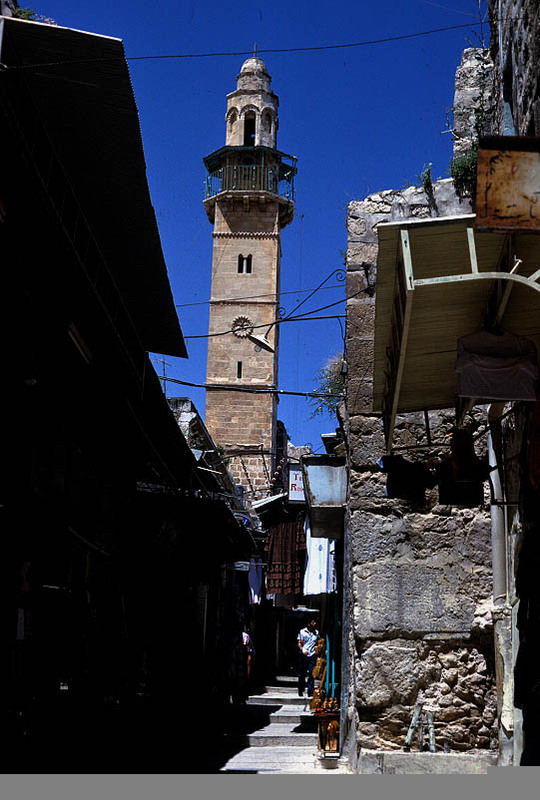 Minaret in the Old City of Jerusalem. 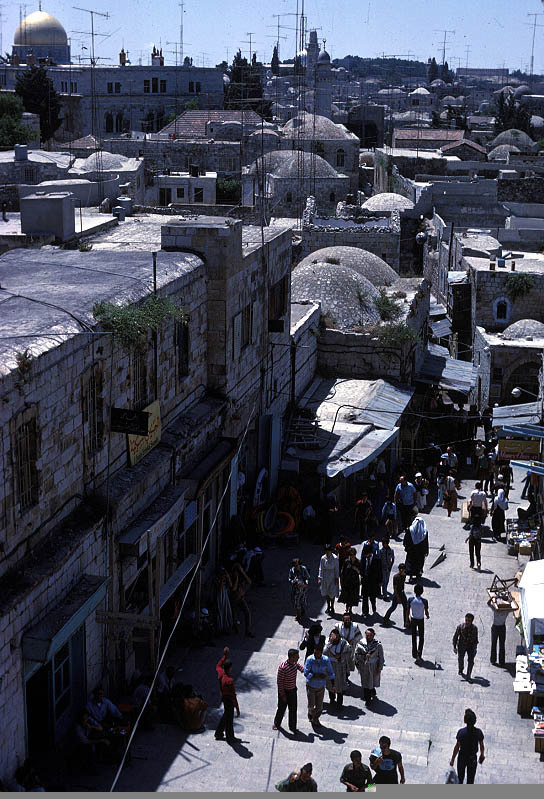 Domed roofs of the Old City with the Mosque of Omar in the distance. Photo from 1980.